2018 recruit Joel Farabee assisted on two goals and Jake Wise set up another as Team USA defeated the Czech Republic, 4-1, in the 2018 IIHF World U18 Championships in Russia. The USA, which clinched a medal for a 14th consecutive year, will seek its eighth gold medal in the past 10 tournaments today in the final against Finland. The game will air live on NHL Network at 10:30 a.m. ET and will be repeated at 7:30 p.m. ET. Farabee, who has eight points (4G, 4A) in the tournament, was named one of the Three Best Players of the Tournament from Team USA. The gold-medal game will be a rematch of last year's tournament final when the U.S. defeated Finland, 4-2, with Farabee scoring twice, including the game-winner. Top shelf, where momma hides the pickles! 2019 recruit Alex Vlasic’s short-handed goal was the overtime game-winner as the NTDP U17s defeated Chicago, 4-3, to advance to the Eastern Conference final in the USHL’s Clark Cup playoffs. 2019 recruit Trevor Zegras also scored for the U17s who will next face Youngstown. The Daily Free Press looks at next season’s schedule which will include road trips to Mankato State and to Boston’s sister city, Belfast, Northern Ireland, where BU will compete in the Friendship Four tournament. That event, begun in 2016, was developed by former Terrier captain Steve Thornton and Shane Johnson. BU’s out of conference schedule also features home games with Quinnipiac, Dartmouth and Arizona State. 2018 recruits Joel Farabee and Jake Wise scored goals in Team USA’s 5-1 win against Russian in the quarterfinals of the IIHF World U18 Championships in Russia. Wise assisted on Team USA’s first goal and Farabee provided the eventual game-winner with a shorthanded goal in the second period. Wise would add an empty netter as the USA advanced to the semifinals against the Czech Republic on Saturday. The game will air on the NHL Network at 10:30 a.m. ET. Farabee has four goals and two assists for Team USA in the tournament and 74 points (33 G, 41A) for the season. ► USAToday High School Sports has rated Farabee #2 among top American high schoolers for the upcoming NHL Entry Draft. 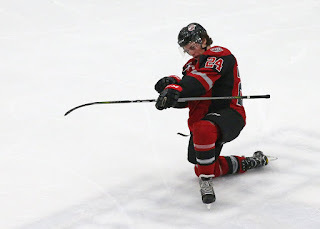 2019 recruit Robert Mastrosimone scored an extra-attacker goal to bring the Chicago Steel even with the NTDP U17s, but Team USA won, 3-2, in overtime. The U17s lead the best-of-five USHL playoff series, 2-1. Mastrosimone, one of the league’s youngest players, had 45 points in 60 regular-season games for Chicago. A pair of former Terriers are being considered to fill NHL general managerial vacancies. The Buffalo News reports the former BU Associate Head Coach Steve Greeley is having a second interview with the Carolina Hurricanes. Greeley, who is in his first season as Sabres assistant GM, had his first interview place last month. The Twin Cities Pioneer Press reports that ex-Terrier Paul Fenton (photo) is the front-runner for the Minnesota Wild job. 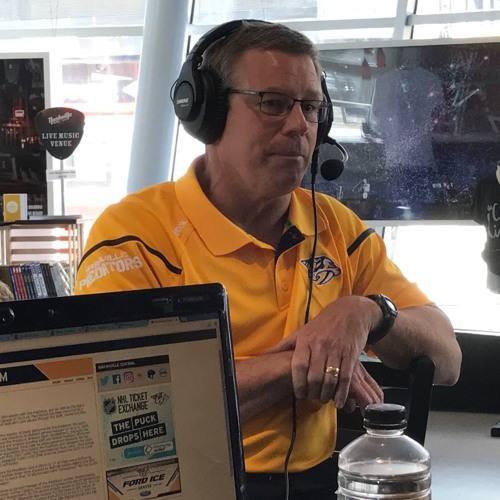 He’s currently the assistant GM for Nashville. 2019 recruit Vinnie Purpura stopped 17 shots in Omaha’s 6-3 playoff win against Fargo. The win evened the best-of-five series at one game apiece. 2019 recruits Robert Mastrosimone (Chicago) and Trevor Zegras (USA) each recorded an assist as the Steel defeated the NTDP U17s, 6-2, in other playoff action. 2020 recruits Braden Doyle and Cade Webber will participate in next month's Massachusetts Hockey Festival in the 2001 birthdate group. Doyle is a defenseman for Lawrence Academy while Webber is a blueliner at The Rivers School, where he plays for former BU All-American Shawn McEachern. Also participating are sons of several former Terriers. Mike Grier's son, Jayden, Scott Young's son Tyler and Scott Lachance's son, Shane, who is also the grandson of legendary BU coach Jack Parker. Nick Bonino scored his second playoff goal and registered two assists in Nashville’s 5-0 win against Colorado that clinched the first-round series for the Predators. Former BU co-captain John McCarthy has re-signed with the AHL San Jose Barracuda. McCarthy had 26 points in 56 games last season and also skated for Team USA in the Winter Olympic games. He was originally drafted by the Sharks in 2006. Terrier recruit MacKenna Parker of the Saskatoon Star led the Saskatchewan Female Midget AA League in scoring with 33 goals and 27 assists in 23 regular-season games. Her team is 10-0 in playoffs and is headed for the national Esso Cup. She won a bronze medal with Team Canada in the 2017 World Junior Championships. Parker also will receive Hockey Canada’s Isolbel Gathorne-Hardy award for the player who demonstrates best leadership and dedication in women’s hockey.